This course will introduce you to the basic principles and terminology of acoustics, and noise control engineering in buildings. You will learn about sound pressure levels, sound power levels, sound intensity levels, vibration levels, frequency, temporal variations, loudness, vibration transmissibility and vibration isolation. You will learn about Noise Criteria (NC) and Room Criteria (RC) curves and how they are used in acoustical engineering projects. Speech Interference Levels (SIL), Sound Pressure Levels (SPL) and Room Constants are also introduced, and you will see how the principles of sound Transmission Loss (TL), Noise Reduction (NR) and Sound Transmission Class (STC) are used in project design. The information you will get from this course will allow you to apply basic acoustical engineering principles to a variety of projects, and will give you the background you need to advance to more sophisticated analyses on more demanding acoustical challenges such as those associated with design of concert halls and recording studios. 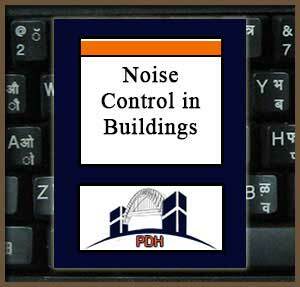 Learn how noise associated with buildings is defined in terms of Noise Criteria and Room Criteria. Learn about designing to mitigate speech interference in the acoustic environment. Learn how sound pressure level (SPL) varies with distance and absorption. Learn basic principles underlying estimation and use of Room Constants. Learn how the principles of sound Transmission Loss (TL), Noise Reduction (NR) and Sound Transmission Class (STC) of building materials are applied to real projects. Learn about STC values for many common building materials.